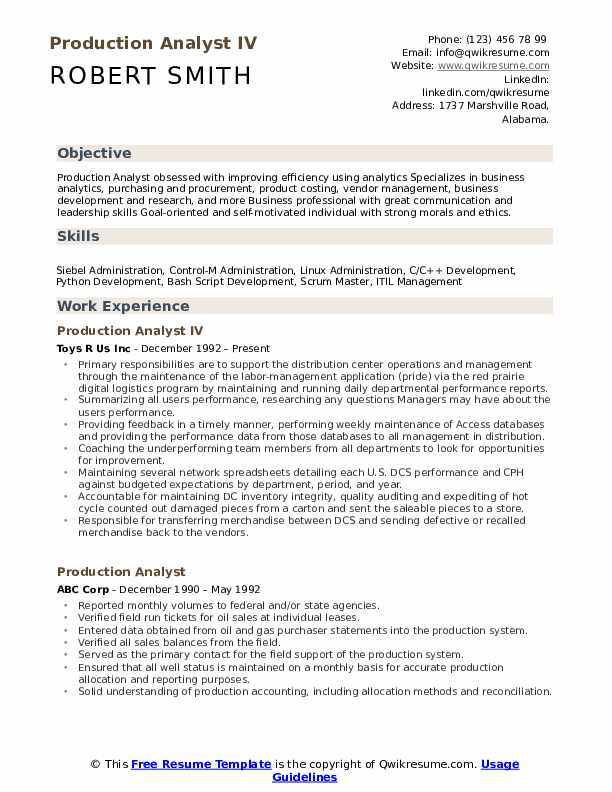 A Production Analyst assists in the day to day ad hoc analysis and reporting in support of production. 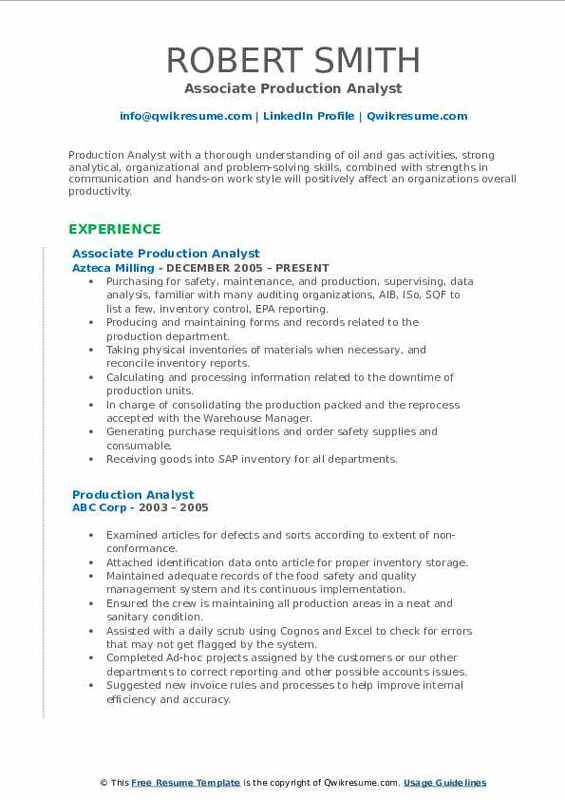 The job description of the Production Analysts include the following responsibilities and duties – working with cross-functional group to plan and analyze the production activities, developing a production plan, processing planned orders, preparing reports pertaining to downtime, delays and equipment repairs; analyzing production and consumption rates, determining production efficiency, participating in weekly meetings to discuss the production issues or updates, monitoring production plan and identifying deviations; generating production reports and monitoring material availability. 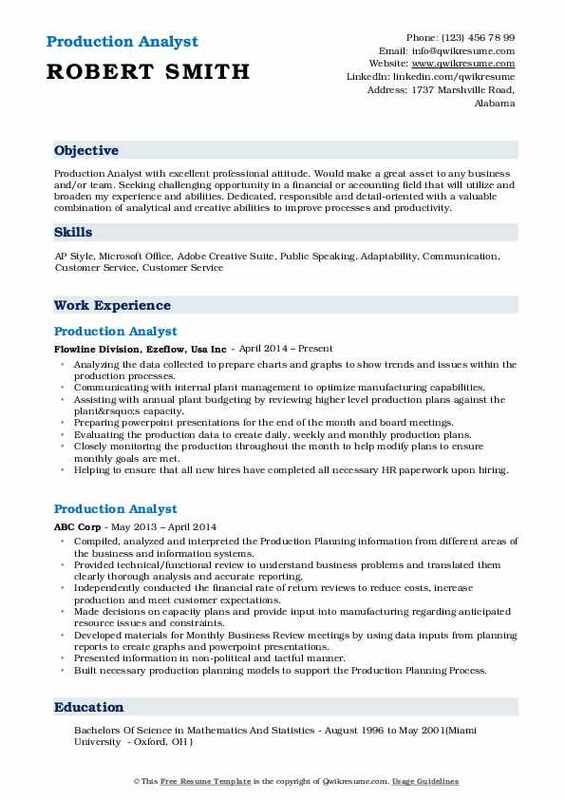 Some of the best Production Analyst Resumes depict job skills such as production expertise, problem-solving, and Leadership, Conflict resolution trait. Strong knowledge of ERP system – mainly in Oracle is considered mandatory for this post. To make a career in this line of operation, candidates are expected to hold at least a Bachelor’s degree in the field of Finance or Engineering. 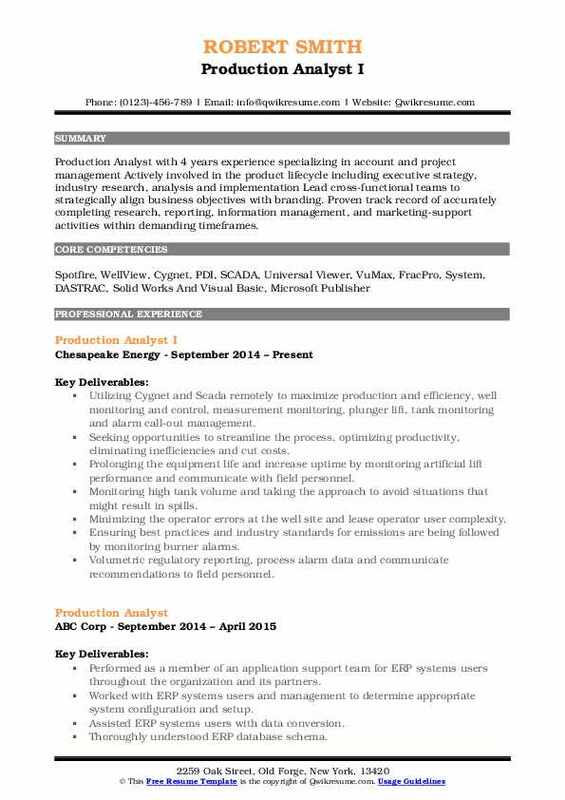 Summary : Production Analyst obsessed with improving efficiency using analytics Specializes in business analytics, purchasing and procurement, product costing, vendor management, business development and research, and more Business professional with great communication and leadership skills Goal-oriented and self-motivated individual with strong morals and ethics. Primary responsibilities are to support the distribution center operations and management through the maintenance of the labor-management application (pride) via the red prairie digital logistics program by maintaining and running daily departmental performance reports. Summarizing all users performance, researching any questions Managers may have about the user's performance. Providing feedback in a timely manner, performing weekly maintenance of Access databases and providing the performance data from those databases to all management in distribution. Coaching the underperforming team members from all departments to look for opportunities for improvement. Maintaining several network spreadsheets detailing each U.S. DCS performance and CPH against budgeted expectations by department, period, and year. Accountable for maintaining DC inventory integrity, quality auditing and expediting of hot cycle counted out damaged pieces from a carton and sent the saleable pieces to a store. Responsible for transferring merchandise between DCS and sending defective or recalled merchandise back to the vendors. 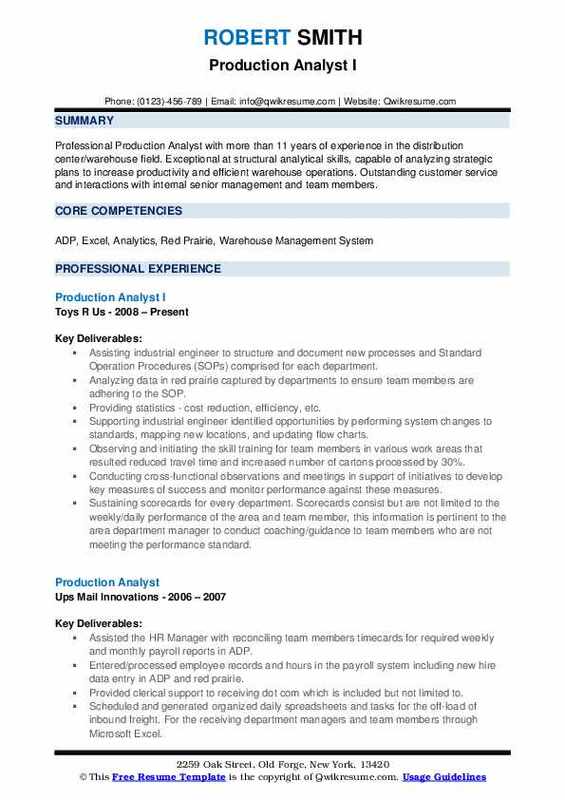 Summary : Professional Production Analyst with more than 11 years of experience in the distribution center/warehouse field. Exceptional at structural analytical skills, capable of analyzing strategic plans to increase productivity and efficient warehouse operations. Outstanding customer service and interactions with internal senior management and team members. Assisting industrial engineer to structure and document new processes and Standard Operation Procedures (SOPs) comprised for each department. Analyzing data in red prairie captured by departments to ensure team members are adhering to the SOP. Providing statistics - cost reduction, efficiency, etc. Supporting industrial engineer identified opportunities by performing system changes to standards, mapping new locations, and updating flow charts. Observing and initiating the skill training for team members in various work areas that resulted: reduced travel time and increased number of cartons processed by 30%. Conducting cross-functional observations and meetings in support of initiatives to develop key measures of success and monitor performance against these measures. Sustaining scorecards for every department. Scorecards consist but are not limited to the weekly/daily performance of the area and team member, this information is pertinent to the area department manager to conduct coaching/guidance to team members who are not meeting the performance standard. 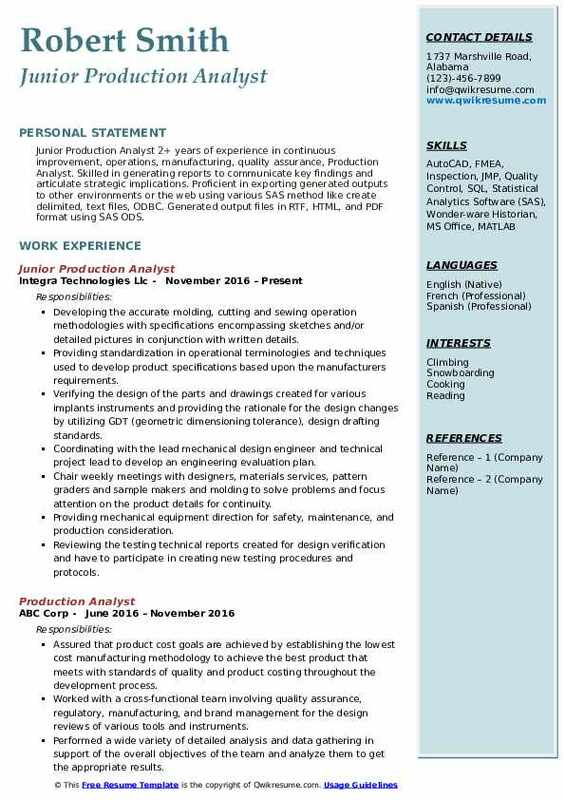 Summary : Production Analyst I with 13 years experience in consistently providing proper flow of raw materials to finished goods to achieve on-time delivery, sales, production and inventory goals serving industries including printed circuit boards, a large sign, and electrical power. Expert in all aspects of materials planning including inventory control and production build plans utilizing various MRP/ERP systems, analytical, communication, organizational, and problem-solving skills. Planned, scheduled and monitored the movement of material through the entire production cycle for 5 departments of over 20 product lines and 200 SKUs. Eliminated the printing, sorting, distribution and manual scheduling of presses and created a visual scheduling system. Frequently took on challenges to improve and create new strategies to maintain expected inventory levels and maximized productivity. Developed procedures for performing weekly cycle counts and audits of repetitive claims. Developed and implemented a repetitive system to replace shop packets. Eliminated scheduling, printing, sorting and distribution of work packets. Streamlining the process to produce the correct parts required by the production floor. Collaborated and implemented lean manufacturing service strategies to convert MRP driven job shops into the customer-driven pull and flow environments. Developed of supermarkets reduced finished goods complexities and moved the production system to assembly to order environment. Collaborated on a team in our business units lean journey kickoff that created and implemented supermarkets and made to order system of scheduling within SAP. Summary : Production Analyst with a thorough understanding of oil and gas activities, strong analytical, organizational and problem-solving skills, combined with strengths in communication and hands-on work style will positively affect an organizations overall productivity. Purchasing for safety, maintenance, and production, supervising, data analysis, familiar with many auditing organizations, AIB, ISo, SQF to list a few, inventory control, EPA reporting. Producing and maintaining forms and records related to the production department. Taking physical inventories of materials when necessary, and reconcile inventory reports. Calculating and processing information related to the downtime of production units. In charge of consolidating the production packed and the reprocess accepted with the Warehouse Manager. Generating purchase requisitions and order safety supplies and consumable. Receiving goods into SAP inventory for all departments. Purchasing parts, tools, and other supplies for the maintenance department in order to have adequate inventories on hand for efficient plant operations. Performing data entry in SAP, Excel, and Word. Performing manual entries in the database pertaining to a preventive maintenance program. Objective : Junior Production Analyst 2+ years of experience in continuous improvement, operations, manufacturing, quality assurance, Production Analyst. Skilled in generating reports to communicate key findings and articulate strategic implications. Proficient in exporting generated outputs to other environments or the web using various SAS method like create delimited, text files, ODBC. Generated output files in RTF, HTML, and PDF format using SAS ODS. Developing the accurate molding, cutting and sewing operation methodologies with specifications encompassing sketches and/or detailed pictures in conjunction with written details. Providing standardization in operational terminologies and techniques used to develop product specifications based upon the manufacturers requirements. Verifying the design of the parts and drawings created for various implants instruments and providing the rationale for the design changes by utilizing GDT (geometric dimensioning tolerance), design drafting standards. Coordinating with the lead mechanical design engineer and technical project lead to develop an engineering evaluation plan. Chair weekly meetings with designers, materials services, pattern graders and sample makers and molding to solve problems and focus attention on the product details for continuity. Providing mechanical equipment direction for safety, maintenance, and production consideration. Reviewing the testing technical reports created for design verification and have to participate in creating new testing procedures and protocols. Headline : Production Analyst with excellent professional attitude. Would make a great asset to any business and/or team. 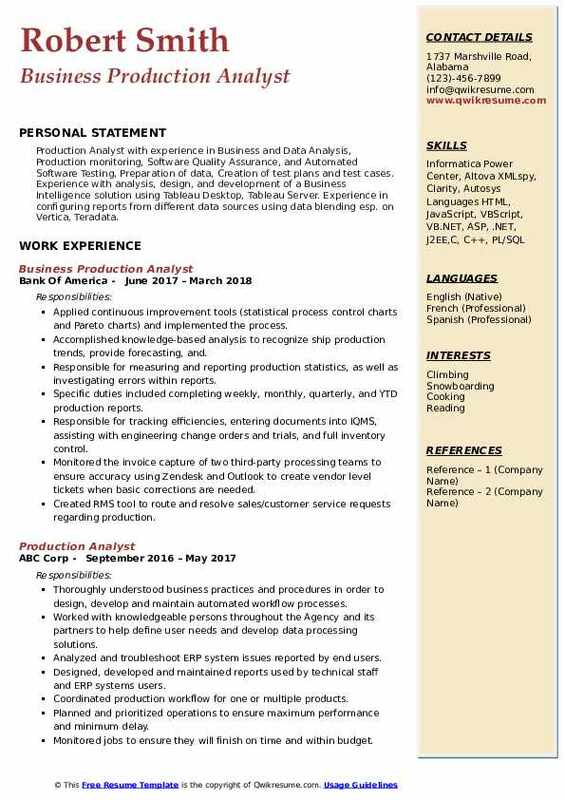 Seeking challenging opportunity in a financial or accounting field that will utilize and broaden my experience and abilities. Dedicated, responsible and detail-oriented with a valuable combination of analytical and creative abilities to improve processes and productivity. Analyzing the data collected to prepare charts and graphs to show trends and issues within the production processes. Communicating with internal plant management to optimize manufacturing capabilities. Assisting with annual plant budgeting by reviewing higher level production plans against the plant’s capacity. Preparing powerpoint presentations for the end of the month and board meetings. Evaluating the production data to create daily, weekly and monthly production plans. Closely monitoring the production throughout the month to help modify plans to ensure monthly goals are met. Helping to ensure that all new hires have completed all necessary HR paperwork upon hiring. Ensuring that the proper safety training and explanation of benefits have occurred with all new employees. Assisting the Quality Manager with ISO:9001:2008 preparations for audits. Reconciles insurance bills to ensure that they are properly coded and paid in a timely manner. 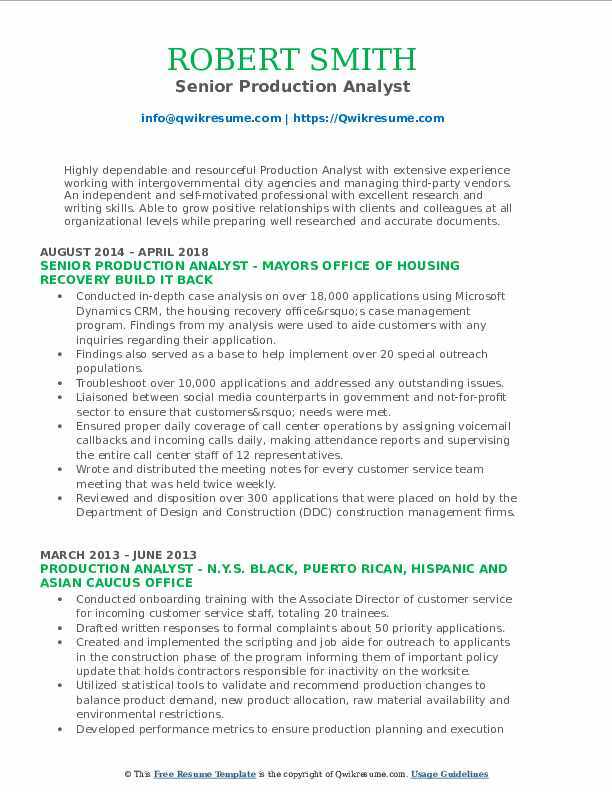 Headline : Highly dependable and resourceful Production Analyst with extensive experience working with intergovernmental city agencies and managing third-party vendors. An independent and self-motivated professional with excellent research and writing skills. Able to grow positive relationships with clients and colleagues at all organizational levels while preparing well researched and accurate documents. Conducted in-depth case analysis on over 18,000 applications using Microsoft Dynamics CRM, the housing recovery office’s case management program. Findings from my analysis were used to aide customers with any inquiries regarding their application. Findings also served as a base to help implement over 20 special outreach populations. Troubleshoot over 10,000 applications and addressed any outstanding issues. Liaisoned between social media counterparts in government and not-for-profit sector to ensure that customers’ needs were met. Ensured proper daily coverage of call center operations by assigning voicemail callbacks and incoming calls daily, making attendance reports and supervising the entire call center staff of 12 representatives. Wrote and distributed the meeting notes for every customer service team meeting that was held twice weekly. Reviewed and disposition over 300 applications that were placed on hold by the Department of Design and Construction (DDC) construction management firms. Provided training to customer service representatives on new policies and procedures, these updates were critical in ensuring that we provided the best customer service to the clients. 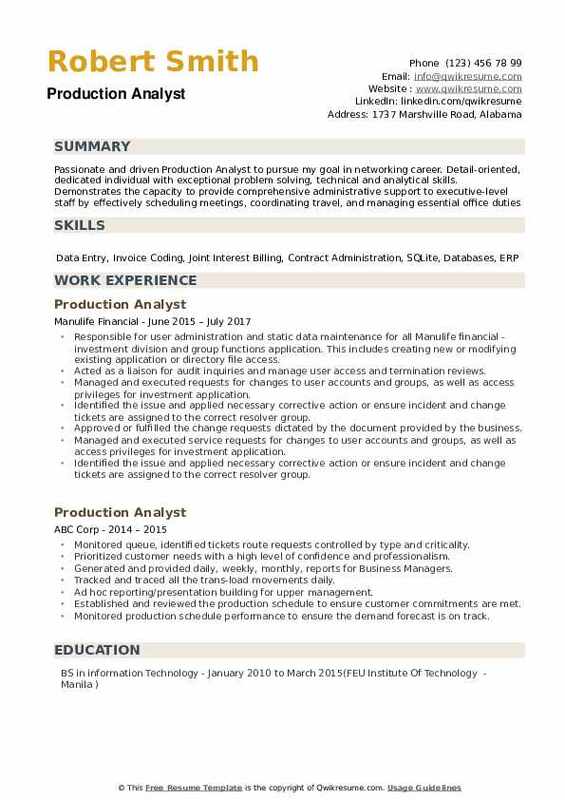 Objective : Production Analyst with 4 years experience specializing in account and project management Actively involved in the product lifecycle including executive strategy, industry research, analysis and implementation Lead cross-functional teams to strategically align business objectives with branding. Proven track record of accurately completing research, reporting, information management, and marketing-support activities within demanding timeframes. Utilizing Cygnet and Scada remotely to maximize production and efficiency, well monitoring and control, measurement monitoring, plunger lift, tank monitoring and alarm call-out management. Seeking opportunities to streamline the process, optimizing productivity, eliminating inefficiencies and cut costs. Prolonging the equipment life and increase uptime by monitoring artificial lift performance and communicate with field personnel. Monitoring high tank volume and taking the approach to avoid situations that might result in spills. Minimizing the operator errors at the well site and lease operator user complexity. Ensuring best practices and industry standards for emissions are being followed by monitoring burner alarms. Volumetric regulatory reporting, process alarm data and communicate recommendations to field personnel. Initiating update or redesign to reflect new organizational requirements. Minimizing the operator errors and promote safety in the field through hazard avoidance. Objective : Production Analyst with experience in Business and Data Analysis, Production monitoring, Software Quality Assurance, and Automated Software Testing, Preparation of data, Creation of test plans and test cases. Experience with analysis, design, and development of a Business Intelligence solution using Tableau Desktop, Tableau Server. Experience in configuring reports from different data sources using data blending esp. on Vertica, Teradata. Applied continuous improvement tools (statistical process control charts and Pareto charts) and implemented the process. Accomplished knowledge-based analysis to recognize ship production trends, provide forecasting, and. Responsible for measuring and reporting production statistics, as well as investigating errors within reports. 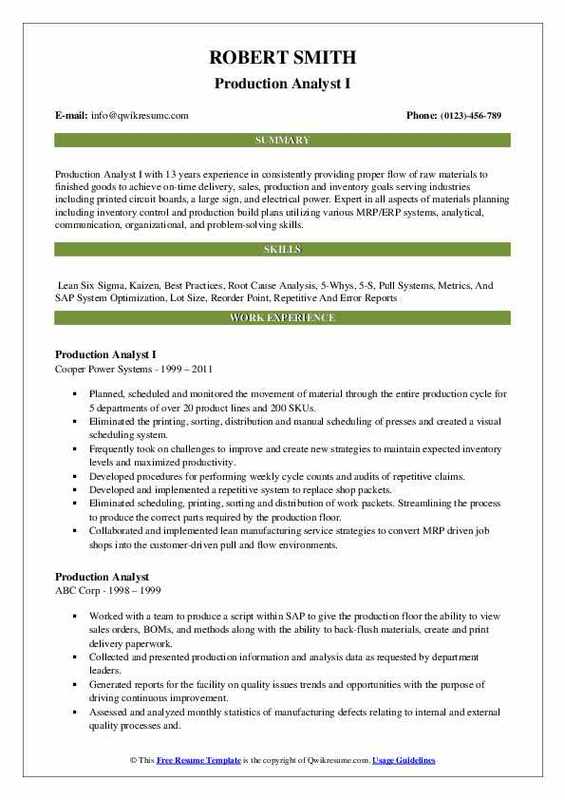 Specific duties included completing weekly, monthly, quarterly, and YTD production reports. Responsible for tracking efficiencies, entering documents into IQMS, assisting with engineering change orders and trials, and full inventory control. Monitored the invoice capture of two third-party processing teams to ensure accuracy using Zendesk and Outlook to create vendor level tickets when basic corrections are needed. Created RMS tool to route and resolve sales/customer service requests regarding production. Responsible for user administration and static data maintenance for all Manulife financial - investment division and group functions application. This includes creating new or modifying existing application or directory file access. Acted as a liaison for audit inquiries and manage user access and termination reviews. Managed and executed requests for changes to user accounts and groups, as well as access privileges for investment application. Identified the issue and applied necessary corrective action or ensure incident and change tickets are assigned to the correct resolver group. Approved or fulfilled the change requests dictated by the document provided by the business. Managed and executed service requests for changes to user accounts and groups, as well as access privileges for investment application. Managed multiple tasks within a heavy workload environment while meeting service quality and turnaround objectives.